1995 Christmas. Our first holiday with Saga and we were well impressed. Only went for a week, to Puerto de la Cruz, and wished we'd booked a fortnight. The hotel (Tryp) was comfortable and the drinks were cheap (very important!) and our rep. (Biljana Mitevic - from Bosnia) was probably the best we've ever had. The weather was excellent (couldn't believe it was Christmas) and the Town was brilliant. One thing. If you go on holiday with Saga and you're only just old enough to go then WATCH OUT! The coach driver and I were the only ones fit enough to unload the cases! (A small price to pay). 1996/97 Christmas and New Year. We decided to do Puerto de la Cruz again but at another hotel (therefore with a different Company). Decided roughly what we wanted and went into the Travel Agents. In those days it was not general knowledge that certain Agents were owned by certain Travel Companies and this one was (unfortunately) owned by AIRTOURS. They guided us towards booking a Hotel (Dania Park/Magec) with Airtours and did we regret it! I'll admit that the weather didn't help (plenty of rain) but the food in the Hotel was below par and the Airtours Reps! Ask them about the buses, they didn't know - if we found out could we tell them! On one of their "exclusive" trips (not recommended) we arrived back at one Hotel and they realised that whoever was meant to get off there was missing! The two reps for we crinklies were on the trip (but were not in charge) and we asked them next day what had happened to the "lost" person. "Don't know, not our problem!". Typical of the Holiday. Airtours - never again. 1997/98 Christmas and New Year. Decided to go further South this time (we were advised to by, would you believe, Brian May - who we had met in the Airport coming home last year - he spoke to us first and was quite chatty after I told him that Edna worked with a chap he went to College with and played with in his first band). Somewhat better. 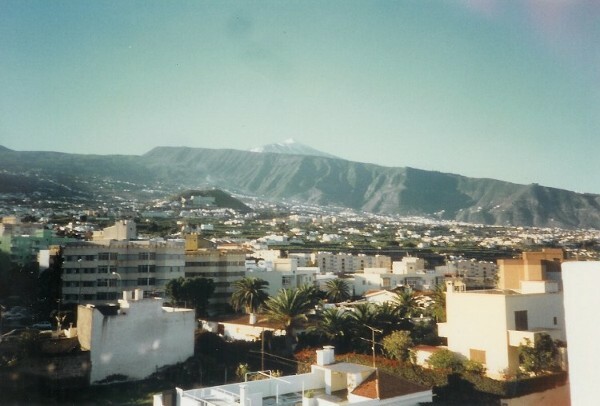 Sunworld, Hotel Oasis, Playa Paraiso - not too far from Las Americas. Large Hotel, we were on the 14th. floor, but the food was pretty awful, the restaurant was dirty and the service was diabolical (not enough staff). Don & Cynthia (who we met in Marathon in 1994) came to see us in the first week and we went to see them in the second week (when sister Ann and her husband Michael joined us). They were staying at Los Gigantes, looked a lovely resort and a nice Hotel (Thompsons). Our local at Playa Paraiso was the "WILD ROVER", a Scottish pub (the football on telly first attracted me). Run by Graeme who played a mean guitar and always invited (late in the evening) everyone to have a "swally" (presumably a Scottish swallow! ), a small glass of a very pleasant liquer. We were called Middlesex by Graeme (apparently everyone is called by their County!). If you go to Playa Paraiso look out for the "Wild Rover" (I hope it's still there). Anyway, even with the drawbacks of the Hotel, we enjoyed our Holiday. 2000 Saga Rose Cruise This was a pretty exciting day! We walked into town and had a wander around, BUT made sure we were back onboard before 11 am because we had arranged for sister Ann and brother in law Michael (who were staying on Tenerife) to come aboard. Ann had always wanted to cruise and jumped at the chance to visit a real cruise ship. I'm writing this in 2015 and Edna and I (this was our first cruise) have now spent nearly 300 nights on board cruise ships! Ann and Michael, who at this stage had never cruised, have spent (possibly) more nights at sea! The pull of Saga Cruises. They loved it and so did we. We had lunch in the Dining Room (not the self service!) with a nice bottle of Chablis (basic drinks were included on this cruise but what the hell!) and Renato (of Rene and Renato) came and had a chat. Ann was chuffed. Went into the Ballroom at 4.15 to have a look at the afternoon tea but, surprise, we joined in (the only time on our cruises that we've had afternoon tea). A terrific day which Ann and Michael will forever thank Saga for (they are now Gold Members of the Saga Britannia Club, as are we). To be honest, they had a free lunch, a free tea, and a couple of drinks but I'm sure Saga have had the best of the deal. 2006 Arcadia Cruise (see the Cruise photos) A shopping trip and a look at the Opera House Complex. La Corte Inglesas for shopping which, Edna said, made Harrods look like Tescos! Bought this, that and the other (but not too much) and so, back to the ship. 2013 Saga Ruby Cruise Caught the shuttle bus into Santa Cruz in the morning, and afternoon. Didn't do much other than wander around. One thing worth mentioning. As usual there were lots of "living statues" but one scared the living daylights out of us! Three female heads, made up in a Gothic style on a table. At first glance looked like waxworks but they suddenly all screamed at us. Who needs laxatives? We didn't! 2015 Magellan Cruise Used this as a shopping trip as Santa Cruz has an excellent shopping street. Almost 40 years ago I bought Edna a watch, the type of which she had specifically wanted. ie. Small, gold face and Roman numerals. This had started to play up and we'd looked for a similar one everywhere. The nearest we'd got, I'd found on the 'net, about £300 and very blingy! What did we find in Santa Cruz? Alright, it was not as good as the old one but it was only €39. Also, in the same shop Edna found a nice white bag (her favourite one had disintegrated recently) for €35. Luckily I didn't have my credit card as there was a really nice one for about €100! Bought a few other bits and pieces, a successful day. 2017 Saga Pearl II Cruise We're getting to the stage now where a lot of walking is out. Wandered ashore but Edna didn't fancy too much walking so I left her on a seat and went for a brisk walk to the Opera House complex.